Top sprinter Admiral delivered another stellar weight-for-age performance to win his 16th race, the $50,000 Luxbet Stakes (1200m) in Launceston on Wednesday evening. Admiral raced outside the leader Gee Gee Red Prince and then lengthened when called on by Luke Currie to score by a neck from Lord Da Vinci. It completed a hat-trick for the Barry Campbell-trained gelding following the LR Conquering Stakes at LR Tasmanian Stakes. 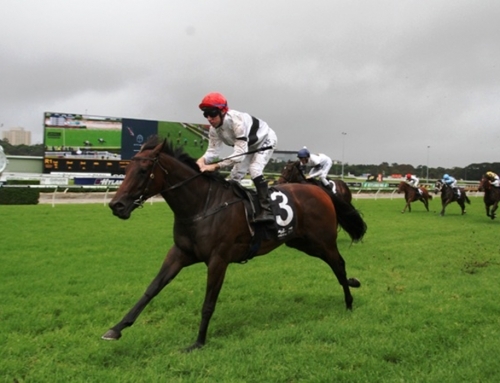 He is now on target for a clean sweep of Tasmania’s weight-for-age races with the Thomas Lyons (1400m) and Mowbray Stakes (1600m) on Launceston Cup day to come. Admiral (5g Mossman – Reunification by West Quest) has raced 26 times for 16 wins and prizemoney of $765,150 for owners Denise Martin, Bruno Calabro and Ron & Trudy Schwanke. Admiral is a son of Vinery sire Mossman who has two colts catalogued for the NZB Select yearling sale at Karaka on Wednesday. Lot 500 is from More Than Ready mare Wonderworld and is a three-quarter brother to dual Macau Horse of the Year Wonder Mossman. Lot 521 is from Testa Rossa mare Alta Floresta who won up to 2000m and is a half-sister to G1 Singapore Derby placegetter Raudkivi.